Picture this: Cooking by Heart on the big screen for the very first time! Mark your calendars, friends, because good things are gonna be cookin at 7p on Feb 12 at 3rd Ward! Moviehouse produces regular events and screenings at 3rd Ward and we’re honored to be a part of it this Sunday. It’s an exciting opportunity for us to premiere our newest piece! In it, Affiong Utuk shares her unique recipe for Nigerian jolloff rice with her daughter, Ediomi. The evening’s events will begin at 7p with food prepared by Cooking by Heart movie stars. Delicious Indian food will be prepared by veteran CBH star, Chitra Agrawal of ABCD’s of Cooking and scrumptious Nigerian food will be prepared by new CBH stars, Affiong and Ediomi Utuk. They’ll be selling samples of a couple vegetarian dishes, so bring some cash. 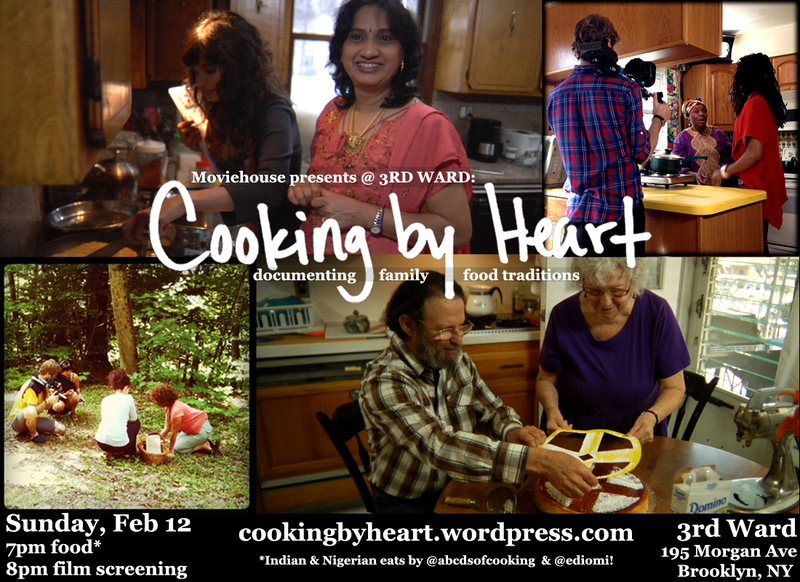 At 8p, the film screening will begin with three of our Cooking by Heart pieces. The feature film will be a 45 minute piece by Theresa Loong. Her documentary, Everyday is a Holiday, tells the story of her journey to uncover secrets of her father’s past. PS. Thank you Chitra, for introducing us to the Moviehouse crew. And thank you Chris and Clara, for making it happen.